I am thrilled to be back at my desk creating again after all the fun and total mind-blowing inspiration from CHA. This is my JustRite card for Laura's sketch this week at 2 Sketches 4 You. The deadline is tonight to win some amazing product from JustRite Stampers. 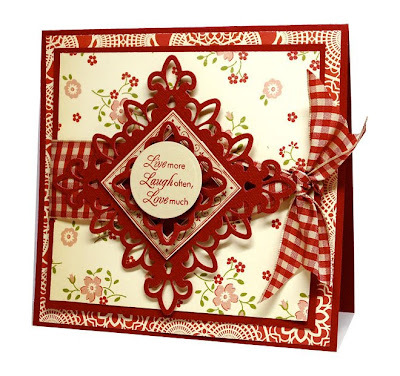 For this card I used the super fun new Decorative 2" Square Monogram kit and the brand new Romantic Sentiments. I also used two of the beautiful Spellbinders Fleur De Lis Pendants for the center of Laura's sketch (which I turned slightly to make it a diamond shape). Thanks for stopping by - I hope you are having an enjoyable Saturday evening getting crafty! So sweet I love that die cut!! Absolutely Gorgeous--- I love every element!! Gorgeous card! So bright and elegant!